Nothing new under the sun? Don't you believe it when it comes to indoor training and as Ol' Man Winter extends his icy fingers over the Northern Hemisphere it is worth taking stock of the rapidly expanding inventory of indoor training aids designed to make the Tour de Basement bearable and even fun. There is no doubt that indoor training has come a long way since the East German technique of riding rollers for hours in a blacked-out room. Resistance trainers were invented to give something more akin to actually riding on the road. From early wind trainers, which boasted hurricane-like noise levels, to trainers using magnets (quieter) to more recent high-tech fluid trainers, noise has always been a factor, along with shredded rear tires. This latter problem was solved with the development of special trainer tires but there was still the question of inconsistencies due to tire pressure or the amount of resistance dialled in. Heart rate monitors gave us some rough ways of estimating power. Videotapes (remember?) came on the scene and tried to motivate riders sweating in the basement by showing scenes of riders sweating on their windtrainers in a gym somewhere. Then there were videos of scenery, with coaching suggestions, all pre-Internet. The stage was now set for the Great Leap Forward through modern technologies with the advent of on-line training applications and the smart trainers that could communicate with them. There was plenty of attention when pro rider Matthew Hayman, recovering from a broken bone in his arm, used indoor training to prepare for his victory at the 2016 Paris-Roubaix race. In the coming weeks we will look at some of the more popular programs, and some newcomers, but first we need a smart trainer to maximize the effectiveness of those apps. The STAC Zero Halycon is one of the most recent and innovative entries in the smart trainer category. 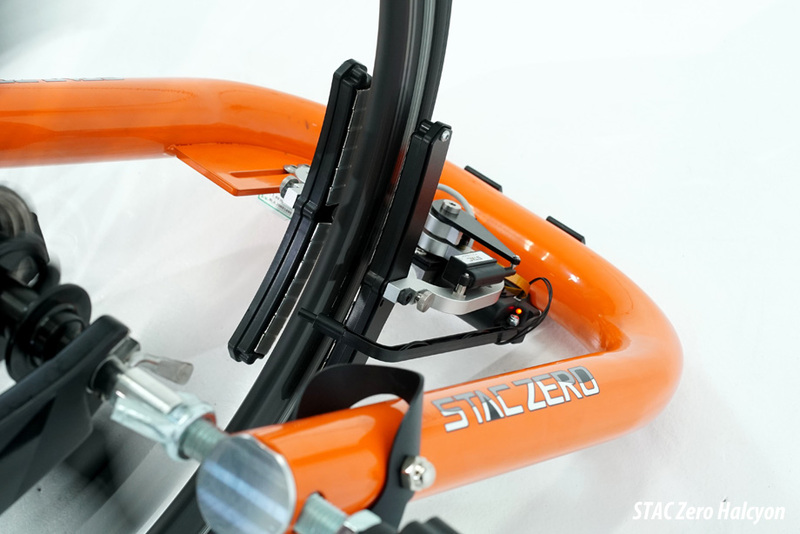 Rather than having the rear tire pressing a drum or using direct drive via chain as is common with other home trainers, the STAC unit takes advantage of physics and uses a pair of electromagnets to set up an eddy current, creating braking forces without actually touching the wheel. Eddy currents are utilized in braking applications, induction heating and for levitation, as in the case of mag-lev trains. The CEO of STAC (which is an acronym for Sports Technology and Athletics Consulting) was inspired to develop the original STAC Zero resistance trainer after riding the Drop Zone ride at a Canadian amusement park, where a 22-storey free fall is smoothly terminated using eddy current braking. A Kickstarter campaign launched in June 2016 was wildly successfully, septupling the original revenue target, and with working prototypes already developed the first shipments of the STAC Zero were sent out to customers by September 2016. Original products were the base resistance model and one with a built-in power meter (both still available) and this year they were joined by the STAC Zero Halcyon, a smart version. The company sells almost exclusively through its website (www.staczero.com) and has shipped to over 40 countries. The trainers are manufactured in a small Ontario town; drawing on high-tech expertise from the nearby University of Waterloo, the STAC team boasts mechanical engineers with expertise in computational fluid dynamics as well as software development directly related to cycling applications. Compared to the high-quality fluid trainer (with a trainer-specific tire) I have used for indoor training for the last decade, I was surprised when the box containing the STAC Zero Halcyon arrived as it seemed to weigh very little. The unit, which has a quality appearance, takes up very little space when folded. 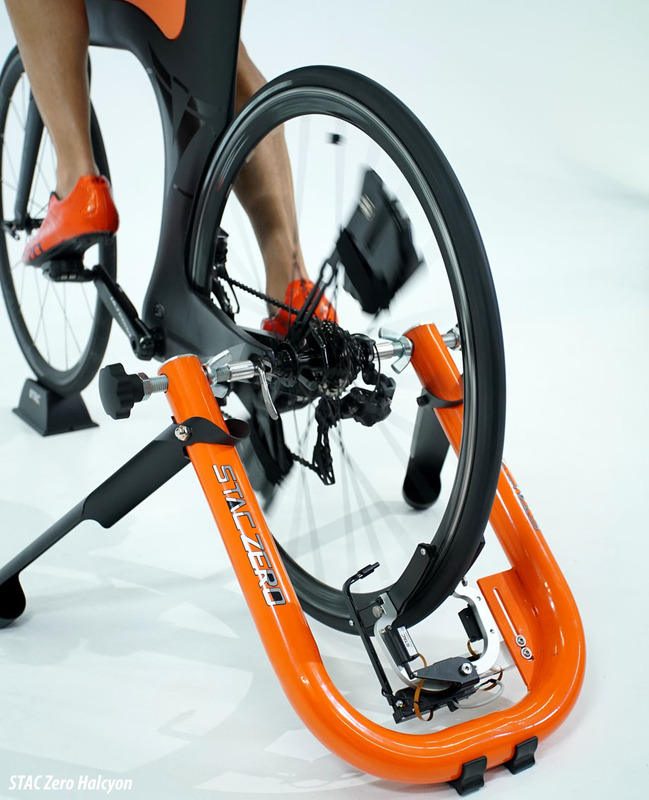 Unlike my fluid trainer, it does not use a heavy flywheel; while the unit can be used as is, STAC offers weights to attach to the spokes of your rear wheel to simulate road feel more accurately. Rather than the cheap wheel I have always used with my fluid trainer, I decided to try the weights on a nice deep-rim time trial wheel since nothing touches it in the STAC system. 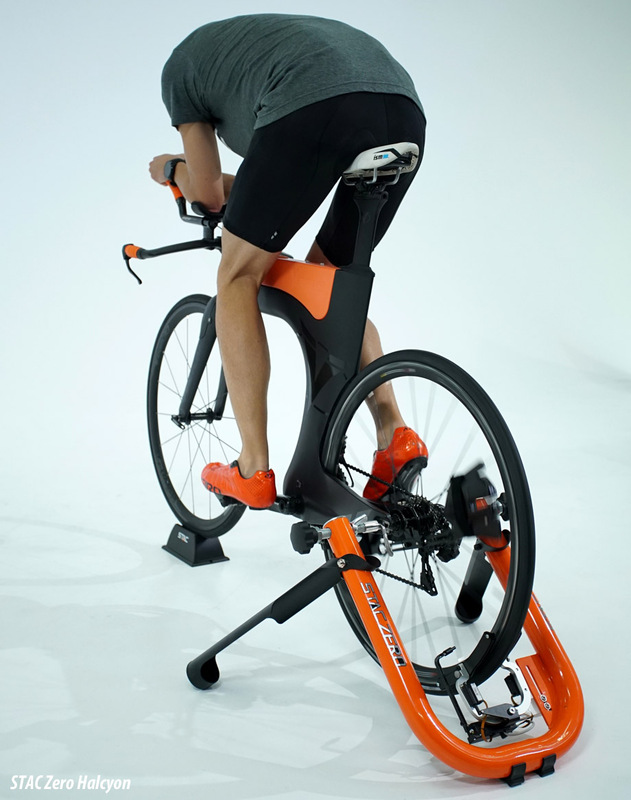 It is easy to set up the bike on the trainer and not having to change the wheel makes it simple when taking the unit out in the field, for instance during warm-up before a race. STAC has a very detailed set of videos on its website showing set-up but I found putting the weights on the first time a bit fiddly, due mainly to my strange spoke pattern. This went very easily subsequently. There are even additional weights available for really powerful riders. For cadence measurement, you will need to get an additional sensor; inexpensive ones are available through STAC or online sources. Arranging the power meter pickup on the Halcyon is very easy as there is a spoke magnet to install and then simply adjusting the receiver, which is on a flexible arm. Turning the cranks brings the system to life after a few moments and it is a bit startling to see the motors positioning the calipers with the electricmagnets against the rim, then opening up again. Upon completion of a ride, the calipers readjust themselves in case there has been any movement of the wheel from the original position. For the system to work, the wheel/tire combination should not have steel in it but I cannot imagine that is much of a problem unless you have been competing in the 1924 Tour de France. Once the calipers have adjusted themselves and you have begun riding for a bit, the first impression that the Halcyon makes is just how quiet it is. I had thought my fluid trainer was pretty quiet but with nothing actually touching the wheel (and you can even ride without a tire if you like!) 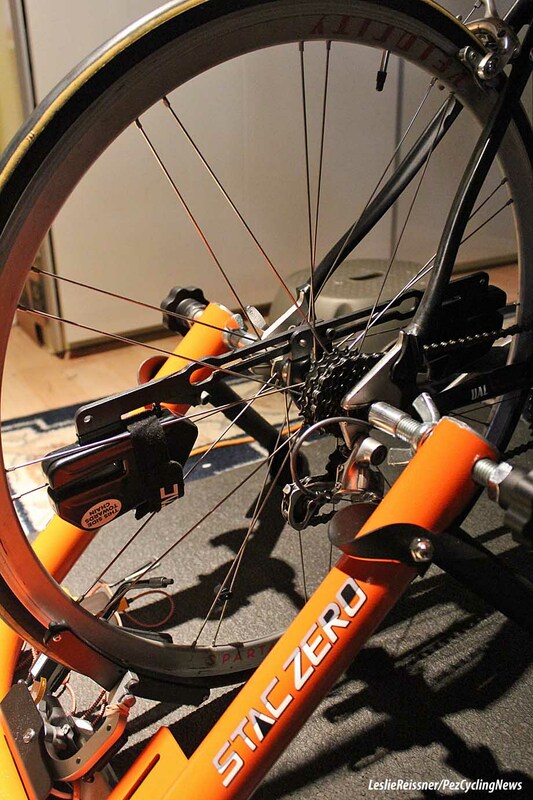 the only sound, except for the occasional whirring of the electric motors, is your chain. And in my case, which is not unique, it was time for a new chain since the noise mine was making was really irritating, previously hidden by the sound of the fluid trainer. So if you live in an apartment or an environment that should be quiet, the Halcyon's silence is a major advantage. I found that I could reduce the sound volume of my training music (early 2000s electro-trance!) by more than half. 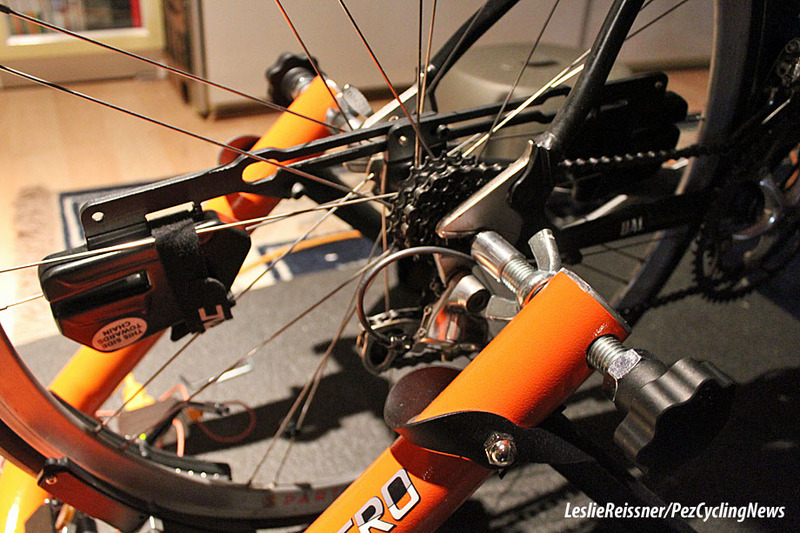 The silent treatment comes with the base and power meter models of the STAC Zero. What makes the Halcyon different? As someone unfamiliar with smart trainers, I had thought that not having to shift gears while riding was “nice to have” but not really necessary for the training experience but I liked the idea that a real power meter would be more accurate than the Virtual Power arrangement I had used for years. In fact, a smart trainer is a considerable improvement of the indoor training experience. As I understand it, smart trainers operate in two modes: Sim or Erg. In both cases, the trainer is communicating with a cycling app, such as Zwift or the Sufferfest, and as you ride the virtual course resistance increases or decreases with changes in the scenery. However, in the Sim Mode it is necessary to deal with these changes by shifting gears to compensate while in Erg Mode, where your goal is a specific wattage, resistance varies to match that output so no shifting is required. On my bicycle in Erg Mode the gears remain in their highest configuration (big chainring, smallest cog). While riding a Sufferfest program, for example, and I am supposed to put out 250W at 90 rpm, if I turn up the cadence to 110 rpm, the indicated power will rise for a moment then drop to the desired 250W while the Halcyon causes the resistance to decrease; drop the cadence down to 50 rpm, and the resistance will increase so that I still produce 250W. This is enchanting. Not so enchanting is what seems to be called The Erg Death Spiral, common to all smart trainers. You can't cheat in Erg Mode—stop your pedalling to catch your breath/adjust your music/throw up etc. and it will suddenly feel like your cranks are in solid cement. Spinning back up is brutal for a moment but encourages you to avoid coasting ever again unless you are in Sim Mode. So after years of riding a traditional trainer I had some adjustments to make in approaching my indoor riding with the Halcyon. I liked the weight of my fluid trainer compared to the old wind trainers, which tended to move around, particularly when doing standing sprints, but the Halcyon's legs fold out pretty far and I never felt that it was unstable at any point in a ride. The Halcyon connected easily to the most commonly-used online cycling apps and can be adjusted more finely using STAC's own app, which can be downloaded to iPad or Android devices (neither of which I possess, to the merriment of the people at STAC). As a neophyte to the world of smart trainers, I was very pleased with the assistance the technical staff at STAC provided to my probably disturbingly obvious questions. There are, of course, competitors to the STAC Zero Halcyon, many better-known, but I cannot comment on them. My experience with the Halcyon has been very good. While the company has advanced quickly in only two years and continues to improve its products, I found the only negative was fitting the weights on the rear wheel was a bit frustrating the first time. On the other hand, here is what I really liked: set-up is very straightforward out of the box; the unit is attractive and of high quality; operation is nearly silent; the unit is portable and easily stored; the power meter is very responsive; the smart function makes meeting training targets extremely accurate; support through online videos and by e-mail is very good; connection to training apps is easy; and it has cool flashing lights. The team at STAC has some other great ideas that come from having so many engineers, like the Virtual Wind Tunnel, but that will be the subject of its own article. The Halcyon is now the best-selling model of the three types offered by STAC and for someone wanting to get the most out of their indoor training (and I do not myself expect to emerge from the basement before April) I believe that a smart trainer and modern online training applications, which we will be considering in the coming days, are worth the additional expense over traditional resistance trainers. Or rollers in a dark room in East Berlin. 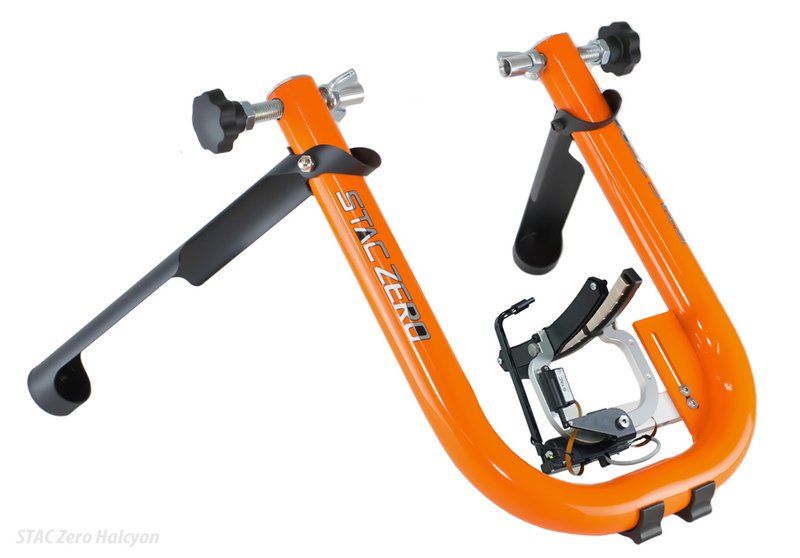 For more about the STAC Zero series of trainers, including the Halcyon, go to: www.staczero.com. When not releasing his Inner Matthew Hayman, Leslie Reissner may be found being erg-ish at www.tindonkey.com.